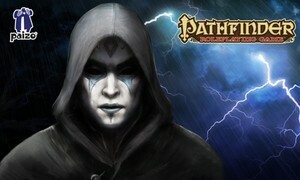 In March 2017 Ben visited the Paizo offices in Seattle. As well as talking business, dreaming and scheming about Syrinscape's new Starfinder SoundSets, and playing a fantastic game of Pathfinder, Ben also grabbed Jason Bulmahn and James Jacobs, put them in a quiet room and had some fun building a couple of SoundSets just for you. As a result of the madness and much giggling that went on in that room, Syrinscape is now very pleased to present you with this, one of two new NPCs to use in your Pathfinder Games. Jason Bulmahn brings you his notorious Priest of Razmir, a terrifyingly convincing rendition of these usurious, dishonest, blackmailing charlatans. If Jason ever starts a religion, run for the hills. How may I 'help' you? This SoundSet was imagined, compiled, designed, created, mixed, and finished by Benjamin Loomes of syrinscape.com, using samples created by him.